Gina Martin's newest line is called From Bump To Baby. Now, maybe you're not in the market for any baby prints right now. 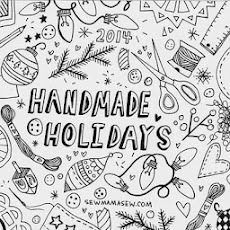 The good news is, the line includes several designs that are fresh and fun and would be at home in any quilt. The graphic patterns are cool, the teensy hearts are to die for, and the floral prints are pretty too. That said, there are some adorable prints that ARE perfect for babies. I love the scatter print - even though my youngest is 4, I still find myself wanting to buy all that sweet baby stuff at Target, like divided plates and cute onesies! The text print is another favorite.The colors are a nice range, not the same old pastel pinks and blues. 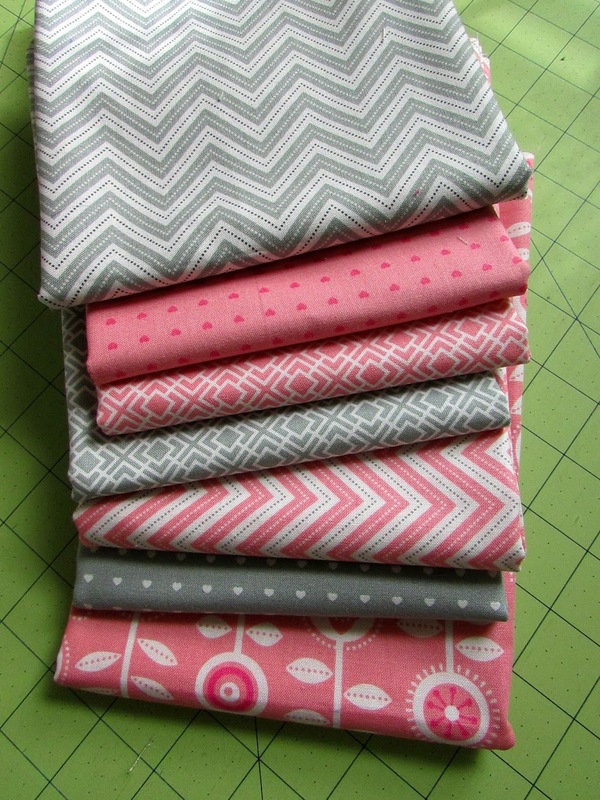 When I got my pretty stack of fabrics, I decided to make a baby quilt. 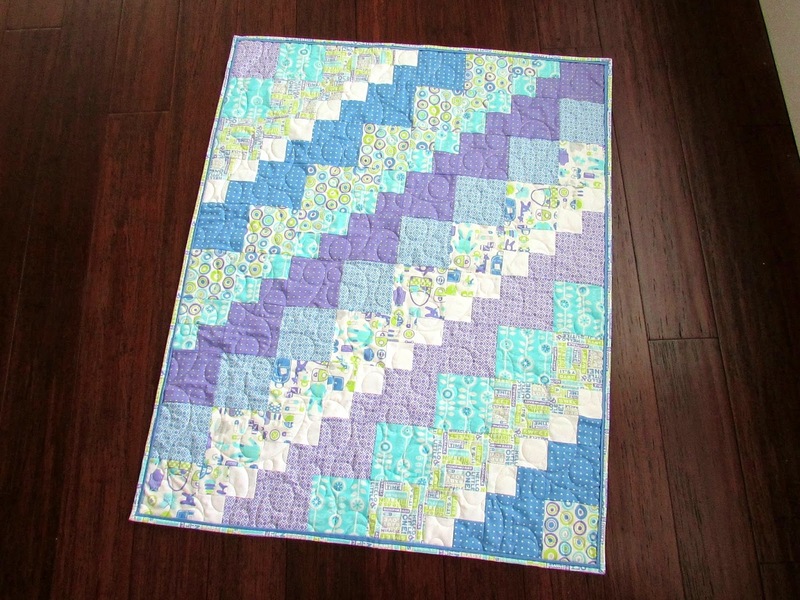 I used a simple layout with an easy to stitch block, commonly known as "sister's choice". I used this block pattern for the barn quilt I painted last summer. It's a favorite of mine, but one I hadn't actually used in a quilt before! Time to remedy that. Repeat, making 8 HST. Trim to 2.5". 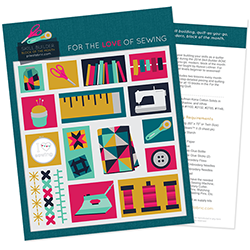 Lay out your squares and stitch together. See, simple and fast! Perfect for chain piecing too. Once you have your blocks completed (I made 9), it's time to sash them together. I used 2.5" wide sashing in both grey and white for my quilt top. Grey for the inner, white for the outside edge. You will also need four 2.5" squares for the cornerstones. My friend Laura did the machine quilting, with an allover design. I like how the pale grey thread looks with all of the fabrics! There's lots of room for some custom quilting in this quilt layout though. 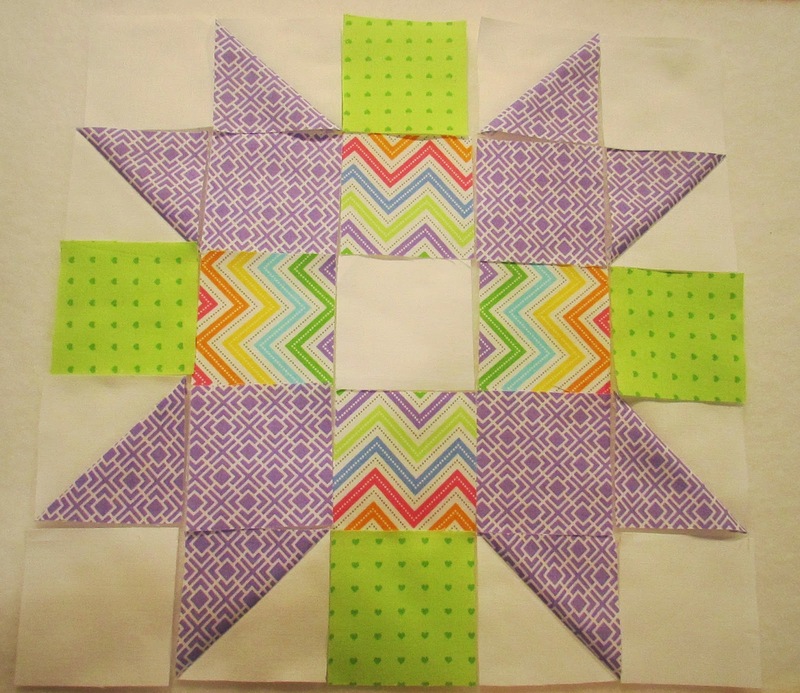 You could switch this up using any 12.5" unfinished block - or make each block different for a custom sampler. 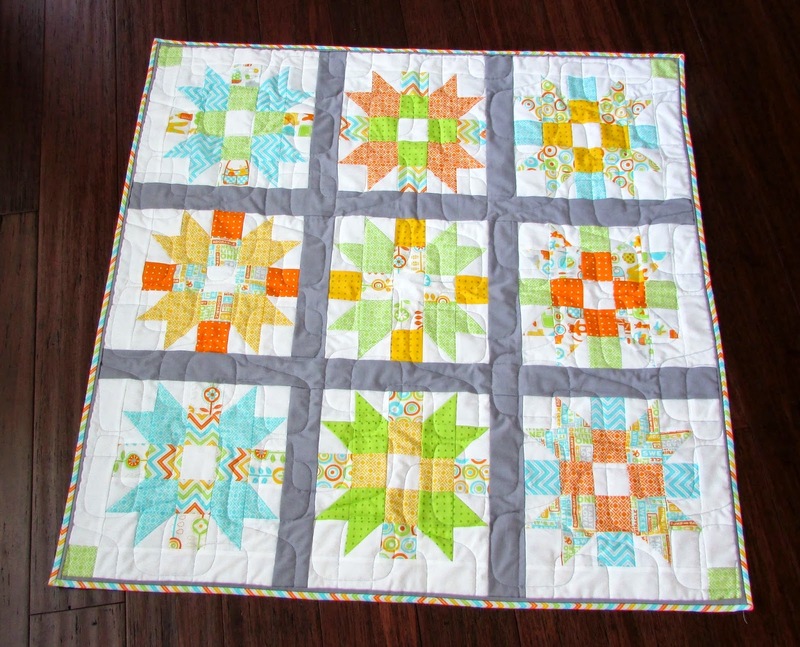 Since this one went together so quickly, I whipped up a 2nd baby quilt using a pattern called Square Dance by Bits & Pieces. This is a popular pattern at Country Fabrics, where I work Friday afternoons. 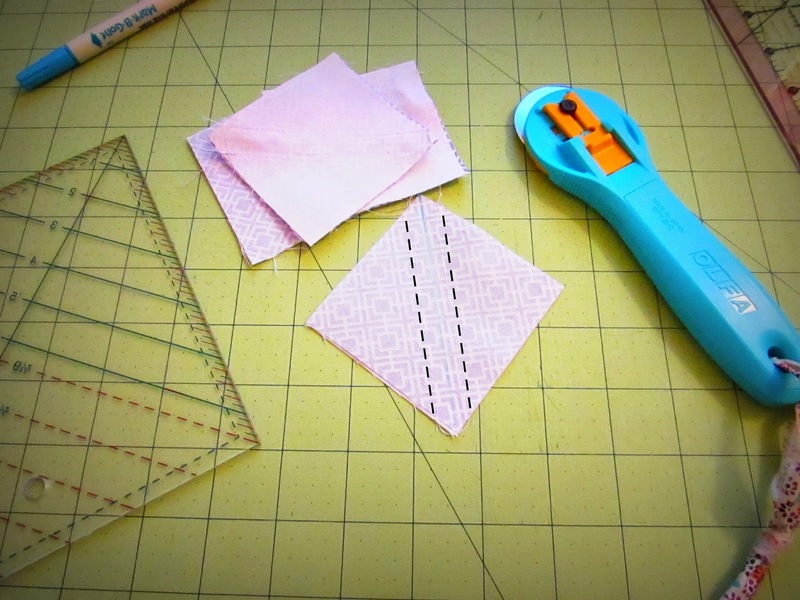 It uses 8 fat quarters and is super fast to put together! I just love these colors! I was going to borrow a friend's little girl to take some photos with, but poor Hattie got the flu and we had to cancel our photo shoot. 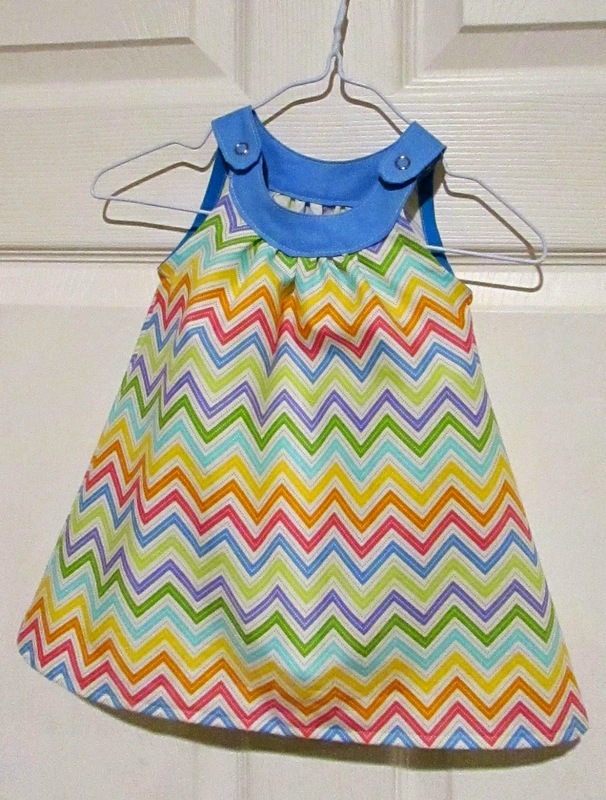 So picture this sweet little dress on a happy 12 month old with cute curly hair :) I used the Snappy Toddler top tutorial at Prudent Baby. Well, if you're still reading, thanks, I know that was a long post!! So how about a giveaway? 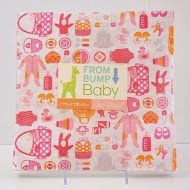 Gina and Moda are letting me give one lucky reader a layer cake of From Bump To Baby! You know how I feel about precuts, and there are so many things you can make with a layer cake! Enter to win the layer cake using the rafflecopter widget below. US only please. Winner will be announced Sunday afternoon, March 1st, and I will contact by email, so make sure I have a way to reach you! Thanks so much to Gina Martin and Moda for the giveaway!! Here's the list of stops, in case you're new to the hop. Each stop has a project to share and prizes to be won, so go check it out! 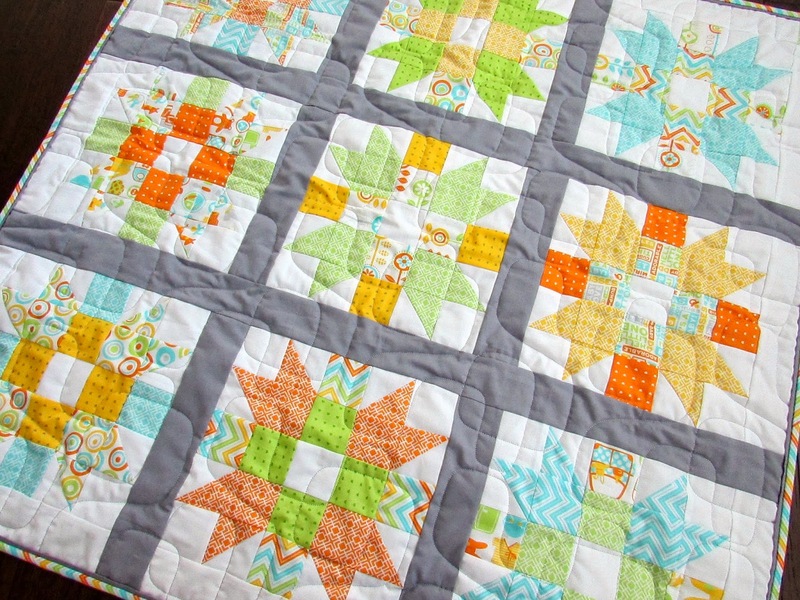 I like both of the quilts you made from the Bump to Baby fabric, especially the second one. Given the block name, I was thinking "Sister Golden Hair" from the song by America. Or "Sister Act" after the movie. Both quilts are wonderful. Thanks for the tutorial block. Looks great! I love precuts, too. I like getting charm packs because they're great as a swatch set to get a good look at the prints in a collection. A layer cake is even better. I find jelly rolls the least easiest to work with but I like them fine. I'm not good at naming quilts. 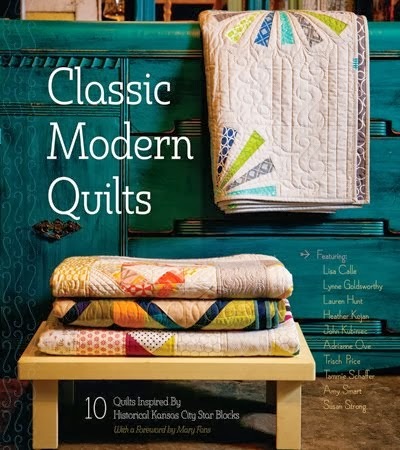 I like both quilts, especially the second quilt. Cute name, I'm no good at that-would have said something like-cross star quilt-boring-I just don't have a great imagination for naming things! HI,love both of the projects! Thanks for the tutorial! I'd call this quilt: "Xtra Cute"! Thanks for sharing a neat giveaway too! I like "Criss, Cross, Applesauce"!, very nice! I have already bought a fat quarter from this line, but I too avoided the obviously baby patterns so that I could use the fabric in anything. Summer Stars, because of the colors and the blocks look like stars. I love this fabric and the quilts you made from it. I am amazed at the number of projects you completed and like the breadth of the ideas you used. Thank you. Thank you for your giveaway! 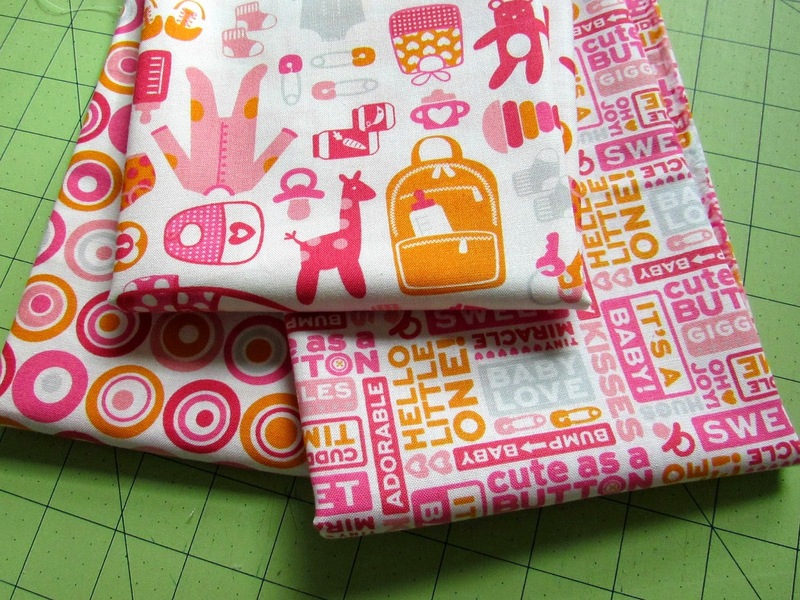 This fabric line is so cute ...any mom-to-be I know would love it for her baby. Those quilts are adorable! and the tutorial is wonderful. I really like your flanged binding. Just the right classy touch to your fine work. I like the name criss cross applesauce! I think crisscross applesauce is a good name. Cross cross applesauce is perfect! The applesauce name is cute. I'm no good at naming to be honest! Maybe something with steps in the name too. 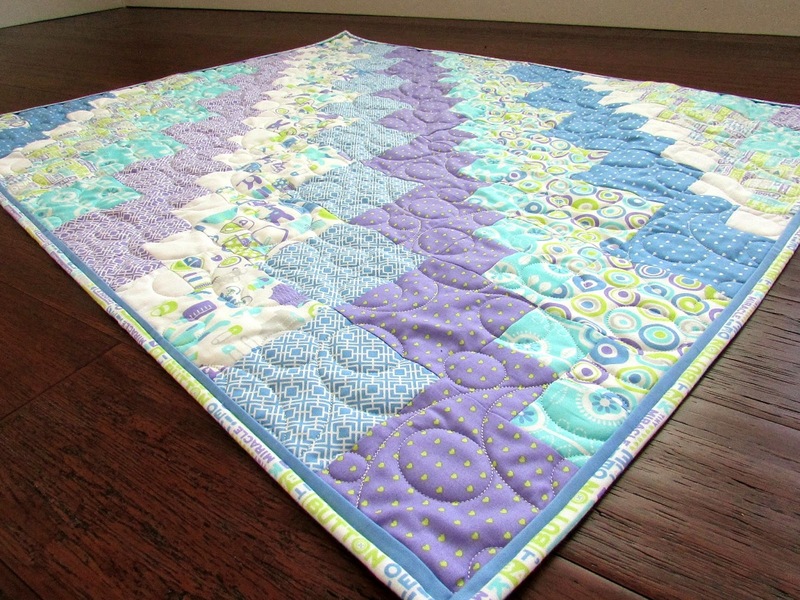 How about Summer Stars... cute quilt! Both quilts are delightful! I can't improve on Criss Cross Applesauce - I think it's the perfect name! The only thing I can think of Sweets for the Sweet. Beautiful quilt! How about criss crossed stars? I'm pretty bad at naming, sorry! Lol! 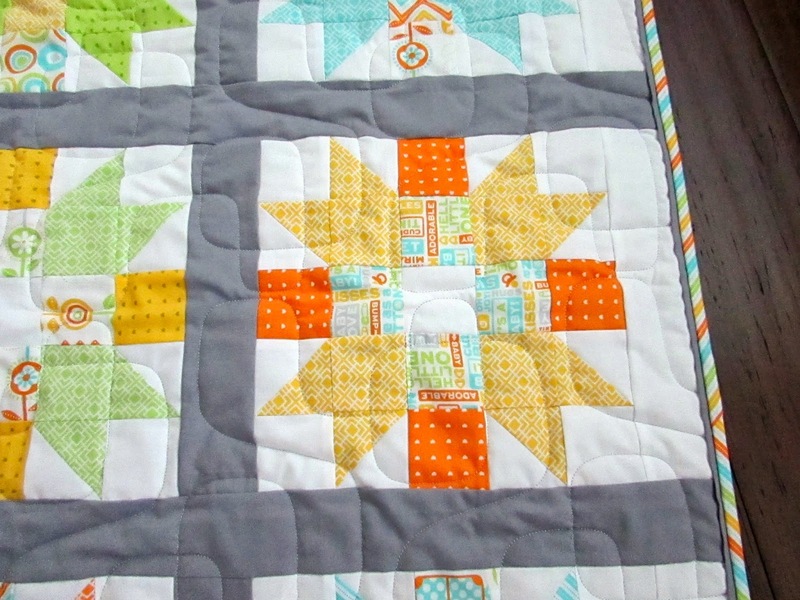 How about...."Your a Star...Your a Super Star"
really love your criss cross quilt!! I think Criss Cross Applesauce is perfect. 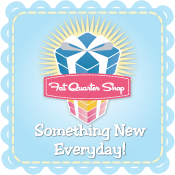 Your Quilts & the lil' sweet dress are all Awesome! Looove the name Criss-Cross Applesauce!! Think it is "The One"...Is perfect! Your idea with applesauce is original! Great quilt! Love the fabric! That's a great name wish upon your star is another good one for a baby. Beautiful quilts and dress! Criss-cross Apples Sauce is super cute. You could also call it Twinkle Twinkle. How about sisters tic tack toe. I love criss cross applesauce for the name. Thanks for the chance to win! I love your block but I am so bad at naming things. I love the name you chose. Cute quilt!!! I am awful at figuring out names for quilts. Good luck! I love the name you came up with. I'd like to add "Dreaming in Color". Beautiful quilt, would love to make one like this. Thanks for the chance. Love your projects. This line is so sweet. I'm in love with the name you've chosen. Criss Cross Applesauce is perfect and such a fun name! Coming from a teacher, I can identify with a catchy name like this! I think Criss Cross Applesauce is perfect! You have really been busy. Love the quilts & love, love, love the dress! I love the name you picked!! ♥ From Bump To Baby Blog Hop! From Bump To Baby blog hop - coming soon!